It’s fun (for me, anyway) to look at the same point in history and see where two branches of your family are. I have previously looked at the Lowry’s in 1880 and just last night discovered the 1880 U.S. Census for Jacob Bahle’s family. Lowry and Bahle are both paternal surnames. 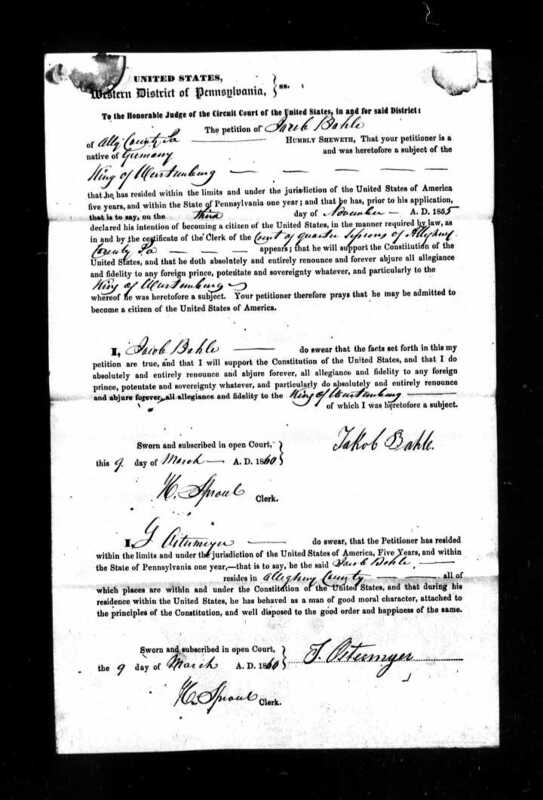 My great grandfather Charles Lowry married Mary Pepperney, whose mother was a Bahle. The Bahle’s are an interesting family, and I’ve discovered quite a bit about them recently. In 1880, the Bahle’s lived in Allegheny, Pennsylvania. Today we know of this as Pittsburgh’s North Side but before 1907, Allegheny was a separate city. While I think they resided on Iten Street (or something similar, see the middle of the ‘N’ in the map below), the street name is unclear on the several census sheets it appears. To further complicate things, upon annexation, many Allegheny streets were renamed because of duplicate names used by Pittsburgh. 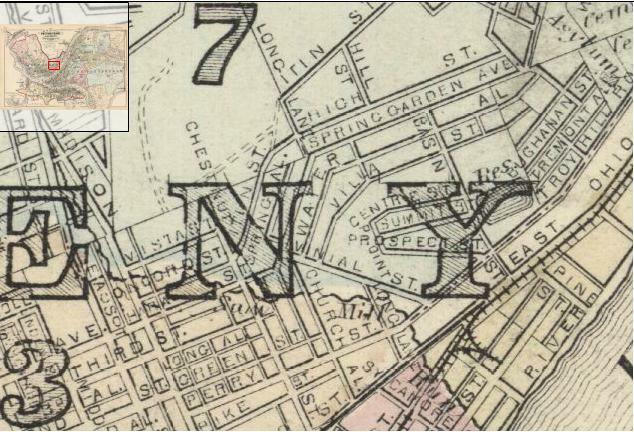 Based on the names of surrounding streets, examining a 1876 map and comparing it to today’s Google Map, I presume they lived in the East Allegheny, or Deutschtown. 1876 map of Allegheny city’s 7th Ward (Source). To see where this is today, click here. For the residents of this street, the census sheet lists birthplaces of Bavaria, Hesse, Prussia and Werttemburg. In the late 1800’s, these were all Germanic kingdoms or duchy’s. Jacob was working in a cotton mill, which is an interesting occupation for Pittsburgh where steel and iron production ruled. While wife Henrietta maintained the home, elder sons George and John were unemployed and looking for work. The younger children were either in school or stayed at home with mom. 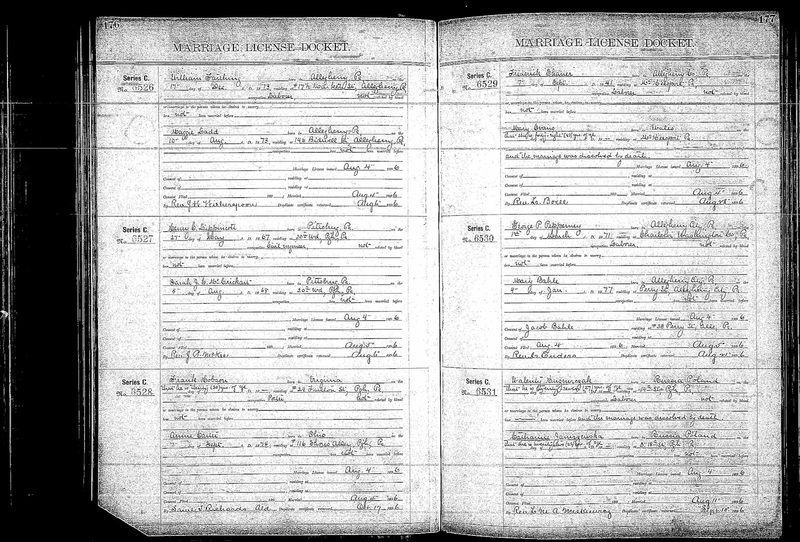 The 1880 Census sheet for Jacob Bahle and his family. Click to enlarge. Finding these records isn’t as easy as you might assume. I had a rough sense that the Bahle’s were living in Pittsburgh in 1880, but wasn’t sure where. A simple last name search turned up nothing. While I’ve manually searched census records for places like Leetonia and Salem, the 1880 Census determined Pittsburgh to be a city of 156,389. After about an hour of using more advanced search techniques (wildcat searches!) on a few different genealogy sites, I found them and discovered by they weren’t easy to find. The enumerator spelled their last name B-A-L-I instead of B-A-H-L-E.
Bali, Jacob White, Male, Age 48 at last birthday before June 1, 1880. Head of household. Married. Occupation: works in a cotton mill. Born in Werttemburg, Father born in Werttemburg, Mother born in Werttemburg. — , Henrietta. White, Female, Age 37 at last birthday before June 1, 1880. Wife. Married. Occupation: keeping house. Born in Pennsylvania, Father born in Werttemburg, Mother born in Werttemburg. — , George. White, Male, Age 19 at last birthday before June 1, 1880. Son. Single. Occupation: laborer. Number of months this person has been unemployed in Census Year: (checked). Born in Pennsylvania. Father born in Werttemburg, Mother born in Pennsylvania. — , John. White, Male, Age 17 at last birthday before June 1, 1880. Son. Single. Occupation: laborer. Number of months this person has been unemployed in Census Year: (checked). Born in Pennsylvania. Father born in Werttemburg, Mother born in Pennsylvania. — , Jacob. White, Male, Age 17 at last birthday before June 1, 1880. Son. Single. Occupation: at school. Born in Pennsylvania. Father born in Werttemburg, Mother born in Pennsylvania. — , Anna. White, Female, Age 10 at last birthday before June 1, 1880. Daughter, Single. Occupation: at school. Born in Pennsylvania. Father born in Werttemburg, Mother born in Pennsylvania. — , Joseph. White, Male, Age 8 at last birthday before June 1, 1880. Son. Single. Born in Pennsylvania. Father born in Werttemburg, Mother born in Pennsylvania. — , Mary. White, Female, Age 3 at last birthday before June 1, 1880. Daughter, Single. Born in Pennsylvania. Father born in Werttemburg, Mother born in Pennsylvania. — , Andrew. White, Male, Age 1 at last birthday before June 1, 1880. Son. Single. Born in Pennsylvania. Father born in Werttemburg, Mother born in Pennsylvania. 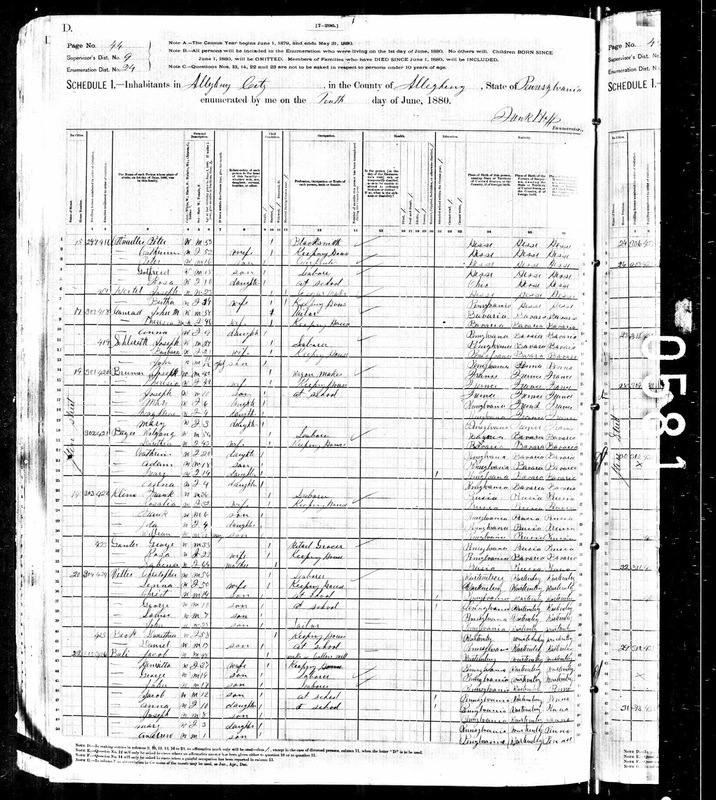 1880 U.S. census, Allegheny, Pennsylvania population schedule, Allegheny, enumeration district (ED) 24, page 44 (penned), dwelling 305, family 426, Jacob Bali; digital image, Ancestry.com (http://www.ancestry.com : accessed 16 February 2013); NARA microfilm Roll 1087. Mary Anna Bahle Pepperney is my great great grandmother on my father’s side. Born in 1877 in Allegheny, Pennsylvania, she was the daughter of Jacob Bahle and (Rachel Snauffer?)*. 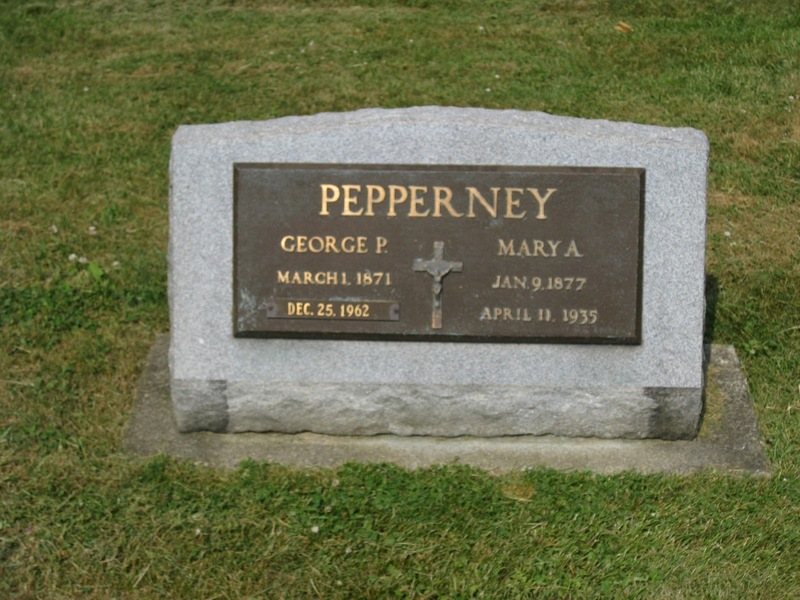 On August 5, 1896, in Saint Mary Catholic Church in Pittsburgh, she married George Peter Pepperney with Rev. Enders presiding. Together Mary Anna and George would have at least six children, with four surviving into adulthood. On Sunday, March 31, 1935, Mary Anna was stricken with a sudden stroke at age 58. She was nursed for two weeks before dying on April 11 at 12:30 p.m.
Mary was buried in Calvary Cemetery, Leetonia, Ohio.Her husband George would survive another 27 years before dying in 1962. *Mary Pepperney’s death certificate provides this name, but so far I’ve found no other records of a Rachel Snauffer married to a Jacob Bahle. 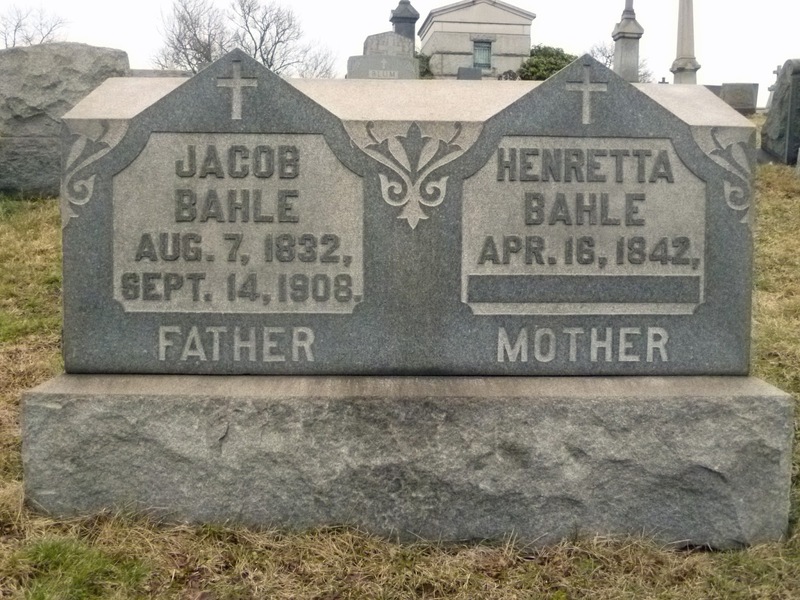 There is a contemporary Jacob Bahle in Pittsburgh married to Henrietta, but I haven’t explored that further..
“Ohio, Deaths, 1908-1953,” index and images, FamilySearch (https://familysearch.org/pal:/MM9.1.1/X6W7-2RF : accessed 10 Feb 2013), Mary Pepperney, 11 Apr 1935; citing Leetonia, Columbiana, Ohio, reference fn 21925; FHL microfilm 2022486. 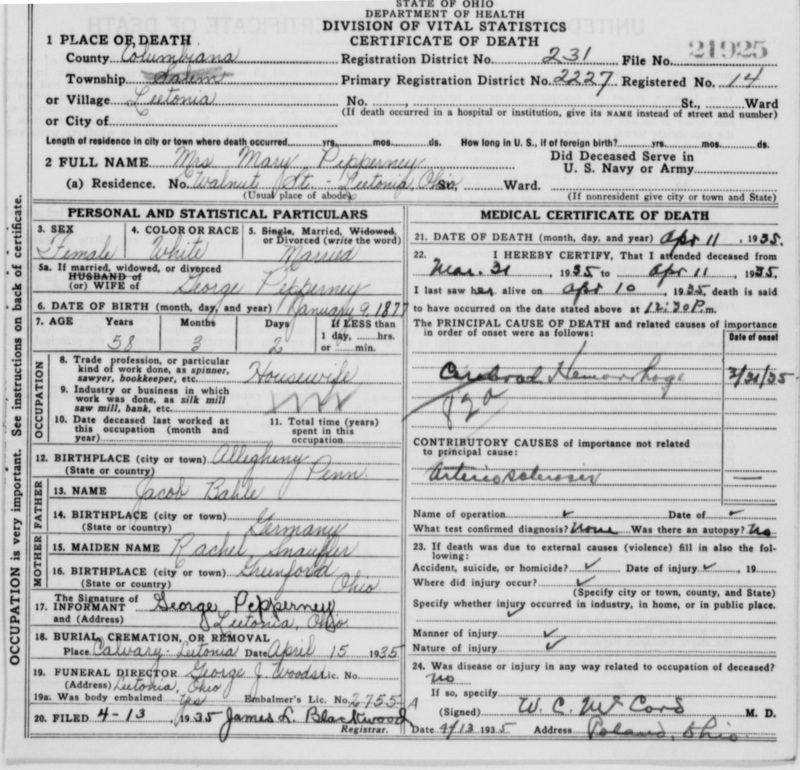 “Pennsylvania, County Marriages, 1885 – 1950,” index and images, FamilySearch (https://familysearch.org/pal:/MM9.1.1/VFMT-KY5 : accessed 09 Feb 2013), George P. Pepperney and Mary Bahle, 1896.